Da Vinci natural bamboo cutting boards are made of eco-friendly renewable natural bamboo offering a durable and attractive cutting surface for all your kitchen applications. No dyes or stains are used in this cutting board so the natural bamboo color will not fade or wash out. Please note that this board is 0.7" or 11/16" thick, whereas most other bamboo cutting boards are only 3/8" thick. There are 2 methods of cutting bamboo for manufacturing a cutting board: Horizontal cut or vertical cut. Once cut, the pieces are then pressed together to make a solid board. 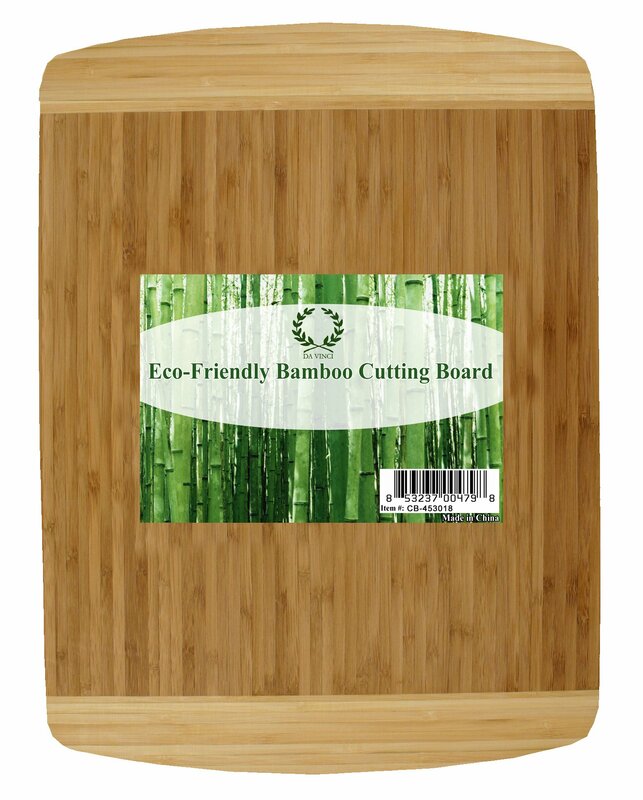 The boards that are made of vertically cut bamboo are much stronger and more durable than horizontally cut boards. All boards that are only 3/8" thick are made with horizontally cut bamboo, hence, they are cheaper. Horizontally cut bamboo can not be used to make thicker boards like our 0.7" thick board. The extra 0.7" (11/16") thick Da Vinci cutting boards are made with vertically cut bamboo making them considerably more durable than the competition. To clean, simply wash with detergent and water and dry. Do not soak in sink or put in dish washer. To significantly increase the life of your board, it is recommended to apply a small amount of mineral oil or beeswax, rubbing with a lint-free cloth in the direction of the wood grain once a month.